For most visits, Cody gives an engaging 45-60 minute presentation on a topic of your choice. Afterward, Cody can do a Q&A with the audience (depending on the timing of your event and your wishes). He will also stay after his talk to take pictures with the kids and give them 1-on-1 time for any children who want to ask him further questions about his life and career. For school visits, Cody is also willing to visit individual classrooms for classes who weren't able to make the presentation, or for students with special needs. Cody wants to work with the people who bring him in to speak. If your school has specific needs in terms of speech content or topics, Cody can easily accommodate those needs into his presentation. Just ask! In this 45-60 minute talk, Cody will tell stories of his humble beginnings in a very small rural town where he had the dream to one day be like his hero - Hulk Hogan. He will tell them a lesson he learned as a youth aspiring to achieve this dream ... the saying "You Can Be Whatever You Want To Be" is a lie. Cody learned that the truth is "You can be whatever you want to be ... if you're willing to put in the work." Cody tells the story of his grueling initiation into professional wrestling and the day he finally realized his dream... the day he wrestled in the same ring as his childhood hero. He goes on to explain that you don't have to be in the "big time" to make a "big difference." He tells stories of achieving his dreams of wrestling with his heroes as he tells stories of rubbing shoulders with Ricky "The Dragon" Steamboat, Jake "The Snake" Roberts, and Rey Mysterio. Youth take away the realization that the size of their dreams should not be limited to the size of their town or other people's expectations. In this 45-60 minute talk, Cody focuses on the power of persevering through hardship. He tells stories of his childhood, which was riddled with alcohol abuse and psychological disorders. Despite these hardships, Cody dared to dream big. Cody was told by his high school guidance counselor that he shouldn't pursue his big dream of being a professional wrestler because he was too small and it would be too hard to achieve this goal. Cody quickly learned that it would be very hard work, but that adults aren't experts. Cody went on to achieve his goals despite the forces working against him. Cody tells the dramatic story of the day he almost died in the ring and the day his dream job almost came to an end from the most unlikely of people. Youth take away the realization that their circumstances don't have to dictate their actions. We all have the power to persevere if we put enough passion and drive into achieving our dreams. In this 45-60 minute presentation, Cody talks about the cycle of influence. Whether we are influenced by positive or negative forces, we can choose to continue that cycle or change it. Cody tells stories of the negative influences on his life at a very young age and a chance meeting in the 9th grade that changed the trajectory of his life forever. He tells engaging tales from his wrestling career that have influenced his life as a father and a man. Cody tells personal stories of special connections he's made with his wrestling fans and his decision to be a positive influence in his community through his charity campaign - "Giv'er for Charity." Youth take away the realization that they all have the power to influence those around them. It's up to them whether they want to be a positive or negative influence in the world. 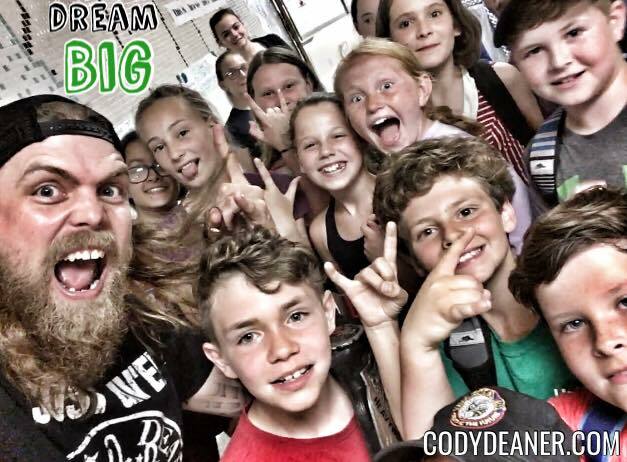 Cody encourages all youth to choose the power of positive influence.